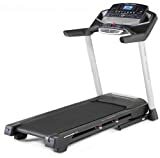 The Proform Performance 1450 treadmill provides great comfort and reliable power from its 2.75 CHP (4.0 HP peak) Mach Z- commercial motor which gives you a max running speed of 20kph (12.4mph) and 0-12% incline. Select both using the console’s quick controls and enjoy the shock-absorption from the ProShox- cushioning that supports the large running area. Speed, time, incline, distance and calories are shown on the 6″ backlit LCD with RaceTrack- display, as is pulse if you hold the hand pulse grips or use the supplied Polar® T34 chest strap. 22 workouts (6 speed, 6 calorie, 5 incline and 5 intensity) are for challenging you and there is iFit Live compatibility, a CoolAire workout fan and Intermix Acoustics- 2.0 speakers with an mp3/iPod input to keep you cool and entertained. The running machine folds up and stores more easily thanks to the Easy-Lift Assist, the Space Saver design and the transport wheels.